Yosemite Valley has such a richness of sheer and spectacular cliffs that I imagine any one of them would rate being a national park or monument of its own in any other setting. Looking at the most famous cliffs, one can be distracted from recognizing the awesomeness of cliffs that loom behind. . We began yesterday with a look at Leaning Tower and Bridalveil Fall at the west end of Yosemite Valley on the south side of the canyon. These rocks are familiar because they are often the first to be encountered when one arrives at Yosemite for the first time. Bridalveil Fall is visible from the Tunnel View, and is the first major parking area when starting the valley loop road. Today's cliffs are the Cathedral Rocks and Cathedral Spires. The Cathedral Rocks are as familiar as Bridalveil, as they provide the backdrop to the falls (above). There are three prominent triangular peaks. From the Tunnel View or from the Valley View turnout they are spectacular, but are not vertical cliffs. 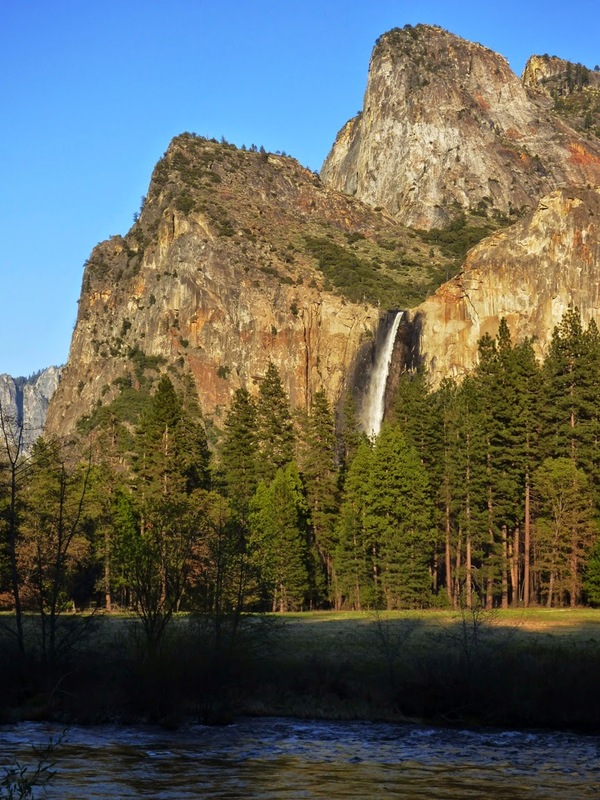 To get that perspective, you'll have to walk or drive east of Bridalveil Falls. Things get very steep in a hurry. One of the first things to note is that the Cathedral Rocks and Cathedral Spires are two different features. The spires are a pair of prominent towers of rock tucked into a recess just east of the Cathedral Rocks. 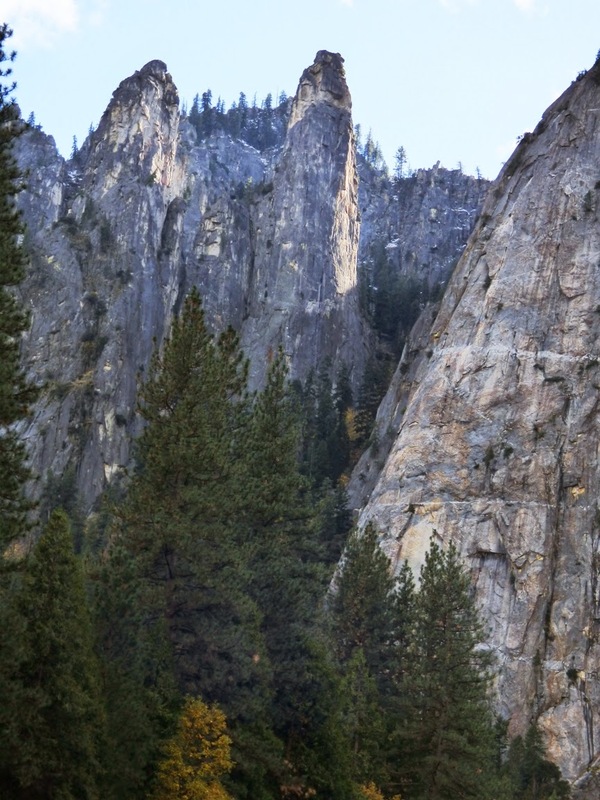 The imposing towers are composed of the very tough El Capitan granite, but are separated by exposures of the highly jointed Diorite of the Rockslides, a rock that is subject to mass wasting (rock falls and slides). Spires like these are usually found along the rim of Yosemite Valley, high above the valley floor, as they are easy targets for removal by glacial ice. 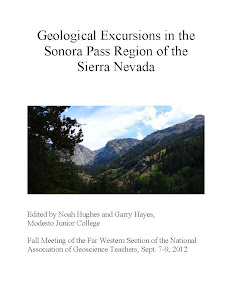 The later ice ages, the Tahoe and Tioga stages, did not come close to filling the valley at this locale, and thus were not able to strip away the narrow fissured towers. 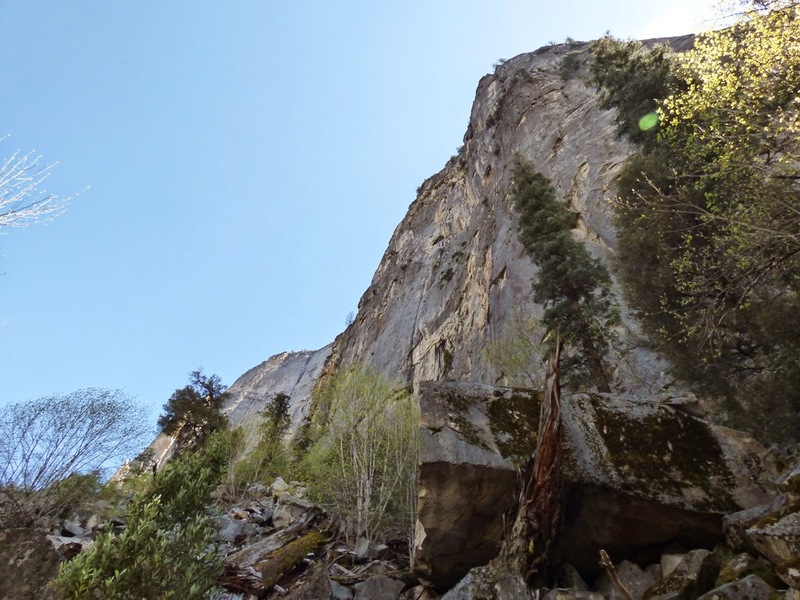 The Cathedral Rocks, when viewed from other angles in Yosemite Valley, are simply stunning. 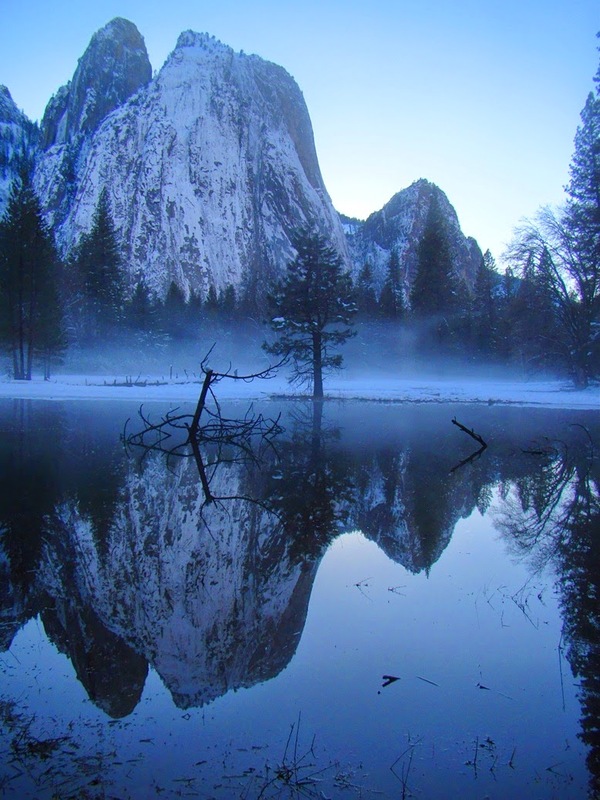 I was lucky to show up in Yosemite in January 2011 on the heels of an intense snowstorm. Snow was literally clinging to the cliffs in the late afternoon, and the winds had died down, leaving a mirror-like lake in one of the meadows, with a cold mist rising. It's one of my favorite pictures (below). Another perspective is provided by the trail that winds east from Bridalveil Fall. 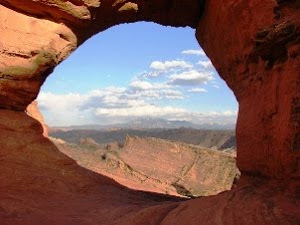 It follows the base of the sheer cliff, an angle hard to capture in a photograph. Does it look to you like the dead stump in the foreground is holding back a really big boulder? 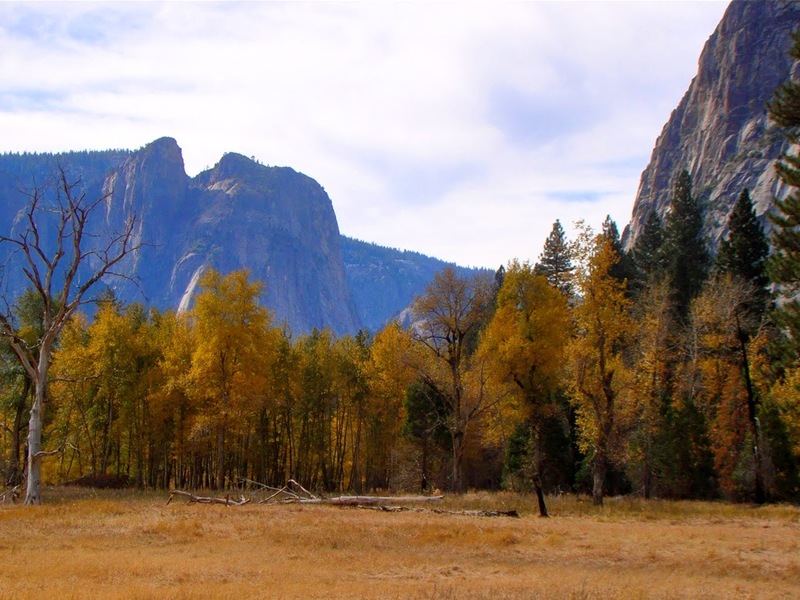 The cliffs are visible from several other meadows, although people are sometimes distracted by the views of El Capitan or Yosemite Falls. 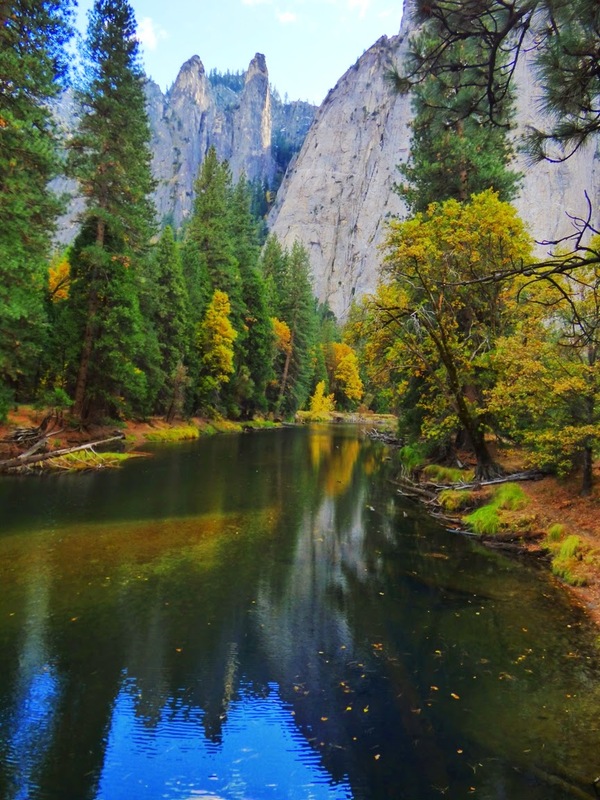 The picture below is from Cook Meadow, which is better known for the spectacular view of Yosemite Falls and the Three Brothers. 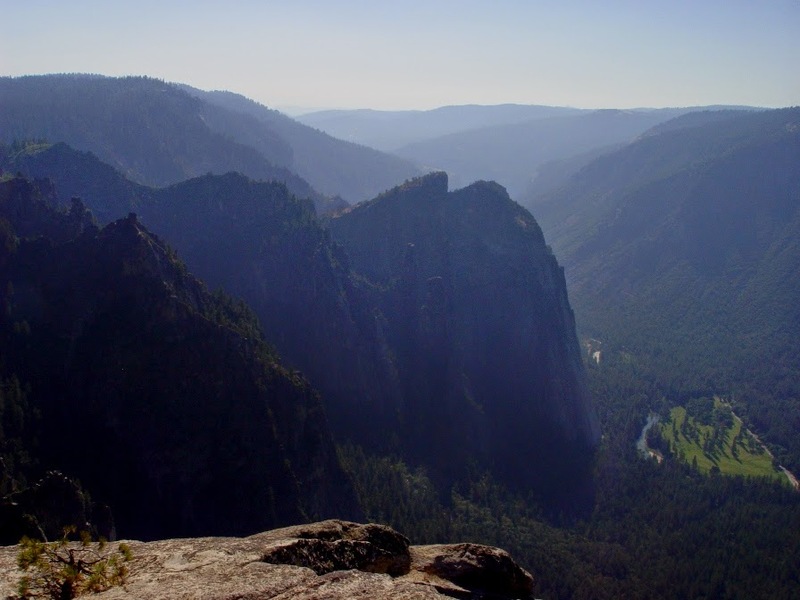 Finally, one should never forget that there are places where you can look down into Yosemite Valley. A drive to Glacier Point is never a wasted day, but one should set aside some time to take a couple of short trails to the rim, including Sentinel Dome, and Taft Point. Taft Point in particular offers a wonderful view of the Cathedral Rocks from above. It is from here that one gains a real appreciation for how tough the El Capitan granite truly is. The rocks project well into the valley, forming a narrow passageway between Cathedral Rocks and El Capitan. The valley is barely 2,500 feet across at this point. El Capitan rises 3,000 feet on the one side, while the Cathedral Rocks loom 2,600 feet above. At this point the canyon is deeper than it is wide!